Although insulating the house takes priority at the moment, my mind constantly wanders to the design of the new garden and in particular to hedges. Trimming hedges is not my favourite activity but the garden needs a hedge all the way round and I will need hedges to divide the garden into sections too. Even if I was firmly against the idea of compartmentalising the garden (which I am not) I am aware that the plot is near the top of a hill and is fairly windy – hedges are essential and although I am keen to plant lots of silly little plants, I need the bones first, to hang the garden onto. So, I need to think about hedges around the edge and within the garden. The planning permission for the house mentions that native hedges need to be planted and although I am not going to lose sleep over breaking this rule, and I am sure no one will check, I will comply. It still leaves lots of choice. And it rules out ‘Leylandii’. I am not of the opinion that this quick-growing conifer is a plague, of itself. But it is too often let get out of control. When looking for a house I completely dismissed one just because it was surrounded by a 10m wall of the stuff on three sides. It can be tamed to make a neat hedge but then cypress aphid moves in and ruins all your hard work. So conifers are out. My favoured hedge in most cases is beech (Fagus sylvatica). It only needs clipping once a year and although deciduous it retains its dead leaves on hedges up to 2m high. I like the freshness in spring and it can be kept neat and tidy. It dislikes wet, clay soils though and so hornbeam is a similar but better plant for wet sites. My site should be well drained but has a little standing water after heavy rain. I need to find out if this is surface compaction or not. I have a lot to learn about the plot. There are lots of beech and oak trees locally so beech should be possible and if so I am thinking of a couple of purple beech hedges. There was a fashion for ‘tapestry’ hedges, mixing green and purple beech but to me this looks like a mistake and is too fussy. In cold, windswept gardens hawthorn (Crataegus monogyna) is often recommended and it has its uses – it produces some flowers for bees, haws for birds and prickly branches to protect nests. But it also gets mildew and it is covered in spines, making clipping, and picking up clippings a complete pain. No thanks. Evergreens have their uses. Holly (Ilex aquifolium) is rather slow but dense. It drops old leaves as the new ones appear and weeding among fallen holly leaves is no fun. 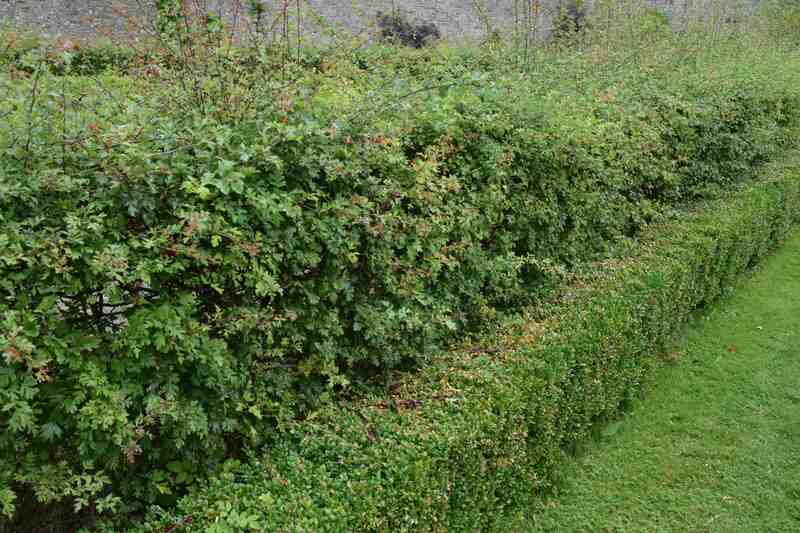 Griselinia is very popular in Ireland and it is fast and makes a good hedge. But I can’t take to the plastic look of the thing. 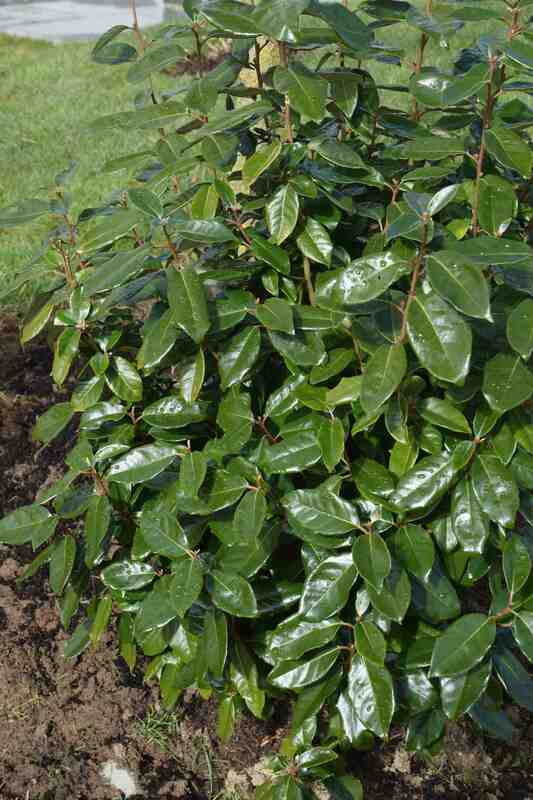 Even so, I am sure I will plant it as an internal hedge if only because of the bright green foliage. I love the smell of Elaeagnus x ebbingei flowers at this time of year and it is fast, upright and a lovely thing. But, it is rather prone to dieback and, if clipped continuously as a hedge, year after year, the mass of old wood is prone to dying. It is better grown as a screen, pruned less rigidly, in my opinion. Lonicera nitida is good as a hedge under 1m high so no good for my boundary and privet (Ligustrum ovalifolium), like lonicera, needs cutting three times a year so is no good either, though the silver or yellow might be used elsewhere. Laurel is also popular but the large leaves dictate careful trimming. 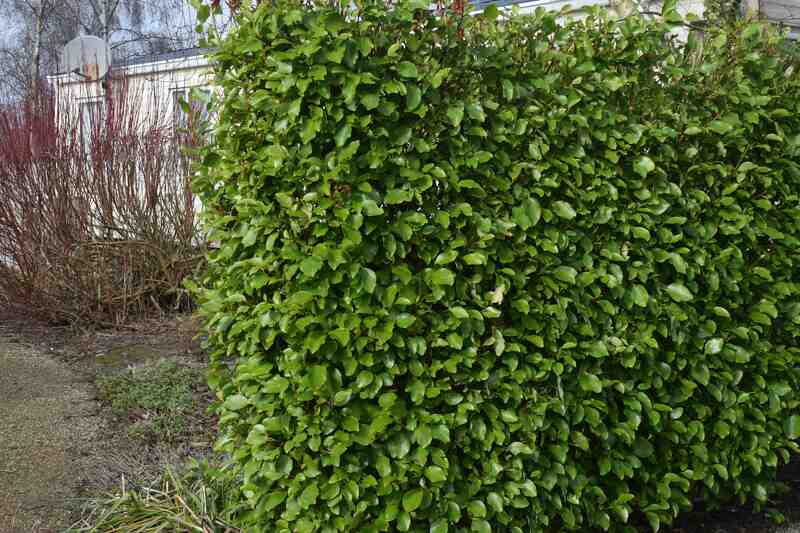 If I wanted a wide hedge then Viburnum tinus would be on my list and it will remain at the bottom of it in case I need something attractive behind some colourful stems in my proposed winter garden. Often considered too slow, yew (Taxus baccata) is a great choice, long lived, tolerant of clipping and it can be reshaped if it gets too wide or tall. The only problem is that it needs to be bought pot-grown or rootballed so is too expensive for the boundary hedge. 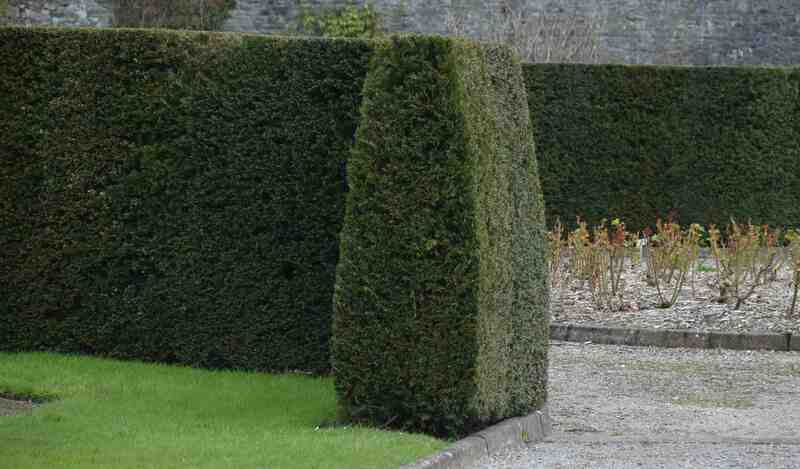 In fact, because I am in a rural area, I think that evergreen hedges would look a bit unnatural. For a while I had decided on beech, then on hornbeam. But I am now sure that the greater part of the boundary (it can be different on different sides after all) will be field maple (Acer campestre). This is not a common choice but the field maple is native and usually a small, rounded tree with lobed, shiny leaves that are reddish when young. The foliage turns butter yellow before it drops. It makes a good hedge that can be clipped once a year. Although it does not retain its leaves in winter like beech or hornbeam it has a dense, twiggy habit. It is hardy and tolerates chalk and acid soils but not very wet sites so I still need to have a dig around before I order. But with more insulation boards to cut and fit I don’t have to make a decision quite yet – bare root hedging can be planted from now till March after all.